Tachyons is a responsive & fast Hugo theme made with the amazing TACHYONS CSS framework & GEOMICONS. Please see a demo site here and another example here. Go to Hugo Releases and download the appropriate version for your OS and architecture. Save the main executable as hugo (or hugo.exe on Windows) somewhere in your PATH as we will be using it in the next step. More complete instructions are available at Installing Hugo. See Options below to customize your blog. Open your browser at http://localhost:1313 to see the results. Customize your blog editing the header & footer under themes/tachyons/layouts/partials/ directory. 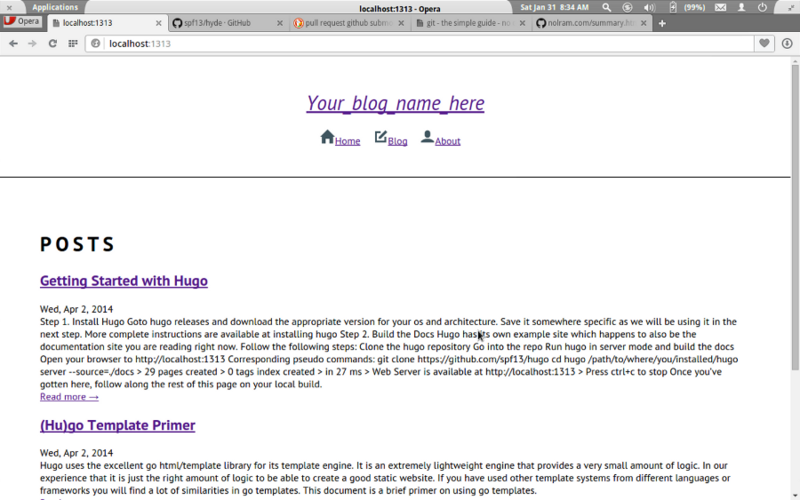 Replace “Your_blog_name_here” to change your new Blog name. If you need to create more sections, you have to add the section name to the nav menu like the example below, then pick up a specific icon from Icon Reference Table.